“Oooh, it snowed!” was my first thought on getting up this morning. I quickly filled up with porridge and set out, unshaven, with my camera. 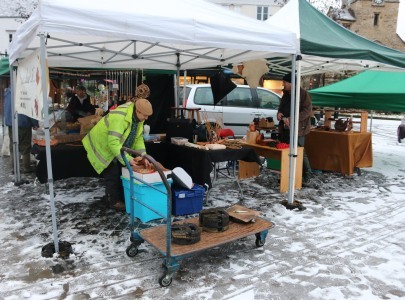 On Abingdon Market Place, stall holders were setting up the quarterly Local Excellence Market. Next one is May, then August. 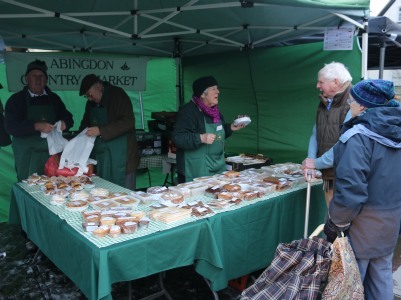 The big news is that the Abingdon Country Market are making their first appearance at the Local Excellence Market – as featured in last week’s Abingdon Herald. 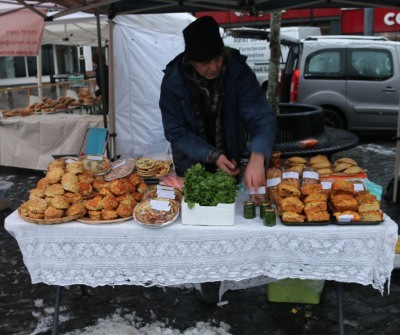 I also spoke to the man from the watercress stall. I think he said he was from Alresford, near Winchester. Watercress beds need spectacularly clean flowing water, and they use chalk-filtered water from bore holes. I gather there used to also be watercress produced at Ewelme, near Wallingford, but I don’t believe that is harvested anymore. After the snow came rain, and it brightened up during the morning, and the snow melted. I hope it keeps nice for The Wassail, from 2:30 to 4:30, at South Abingdon Children Centre. 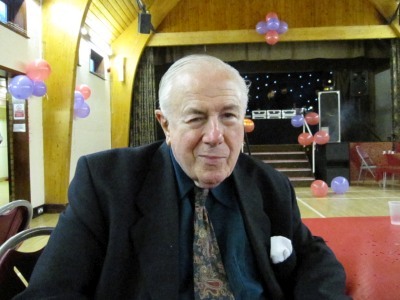 This is a small incite into the background of my former neighbour Tony Broad who died on 15th January aged 93. He talked a lot about his work at the MRC Laboratory of Molecular Biology in Cambridge where so much innovative research was being undertaken over the years. Tony went through Technical college and then to EMI where he honed his technical knowledge on Cathode Ray Tubes. He worked under Otto Klemperer there. Georgina Ferry, a Scientific blogger, writes that he was the creator of a nobel prizewinning x-ray tube. He was the inventor and creator of many clever devices, before and after. After working at Cambridge he moved to Harwell and then set up his own company where he worked on early hole in the wall cash machines. Even in retirement he would spend his time creating fixing and rebuilding things. His work was his life. Lesley says Tony also had narcolepsy all his life. He would fall asleep when she was visiting him and even on his mobility scooter once. But still managed to execute his work brilliantly. 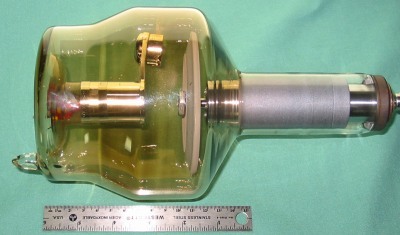 Pictured is – a rotating anode tube of the type originally designed by Tony Broad – his most important invention (Picture Thanks to: Daniel W. Rickey, Wikimedia Commons). 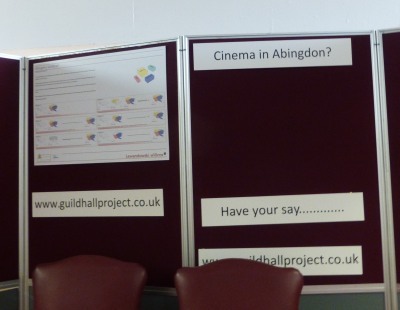 The Abingdon-on-Thames town council meeting in the Guildhall began with a presentation by the Abingdon Carbon Cutters about Abingdon as a town in transition to a more sustainable future. We heard that the Mayor’s quiz made a £2000 profit for charity thanks mainly to Paul Mayhew-Archer, the question master. The Mayor’s Civic Dinner is on Friday 13th February. It includes a meal of local produce, fair trade wine, and Scottish Dancing. The museum are aiming to put on a John Piper exhibition and would like anybody with an original John Piper picture, or print – of a local scene – to get in touch. The Roysse Court Gardens are to be worked on by council staff this early spring and the council want to remove the fountain so the area can be repaved. Anybody who wants a fountain and is willing to collect should get in touch. Postage would be hefty. Groups interested in taking part in Fun in the Parks can apply in February. Next year’s budget was agreed. All the main items had been talked over already in committees and in Conservative or Lib-Dem group meetings and so they were agreed with little discussion. What caused a lot of discussion was whether the Mayor should get an additional £500 allowance. The proposal was eventually voted down. 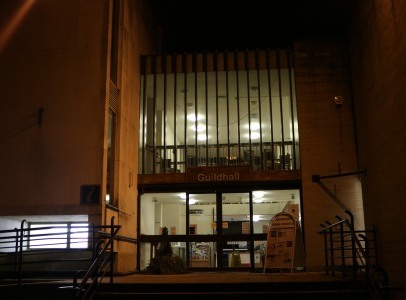 The Guildhall is being closed on 31st August for re-development, lasting no less than 12 months and likely to be 18 months. The exact re-development details are still under discussion but will involve improved accessibility overall, and a major change to the large Abbey Hall with cinema screen and raked seating. As the older buildings had already been renovated, I was suprised to hear that they too will close for ’various heritage improvements’. All user groups including the Town Council committee meetings will be looking for rooms during the closure period. The intention is to make it a much better venue and attract lot more groups and events. 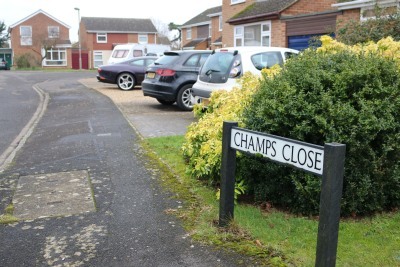 Champs Close (Peachcroft) This is an old field-name, possibly derived from the French ‘champs’ meaning ‘a field’. 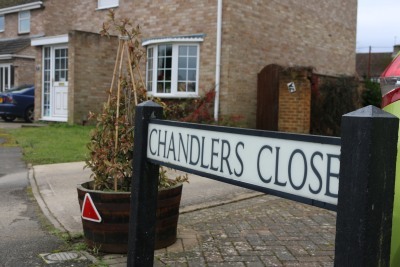 Chandlers Close (Peachcroft) Named after a field-name on the Radley Parish Tithe Map. 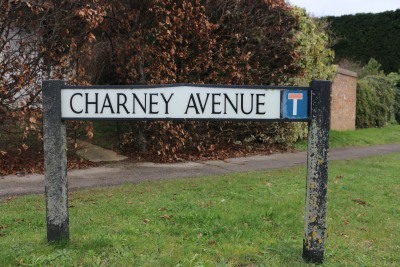 Charney Close (Peachcroft) This is also called after an old field-name in Radley Parish. 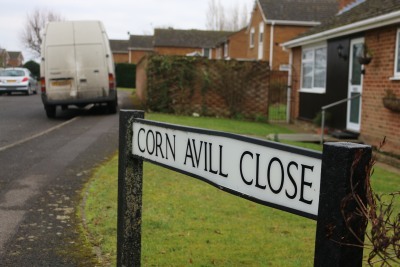 Corn Avil Close (Peachcroft) This is an old field-name in the Parish of Radley. Thanks to ‘The Origins of the Street Names of Abingdon’ by John McGowan 1988. It needs to be updated and brought back into print. 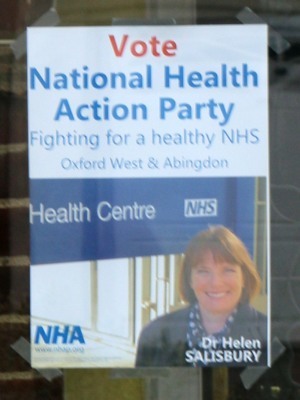 I saw my first election poster in St Peters Road, Abingdon. 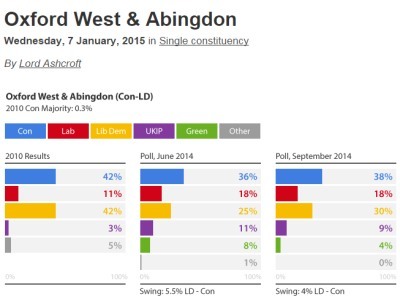 Since this is a marginal seat, Lord Ashcroft has been polling Oxford West and Abingdon as one of his 114 Constituency Polls. There are just 100 days to go until the General Election on May 7th (from 26th Jan 2015). The District Council and Town Council elections will be on the same day. 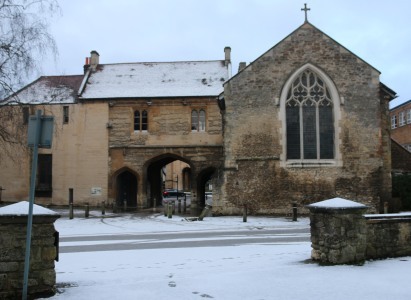 There will be a Town Council meeting this Wednesday (28th Jan at 7 pm at the Guildhall), including a discussion on the future of the Guildhall. So if you are interested in standing, why not go along and see what it’s like.